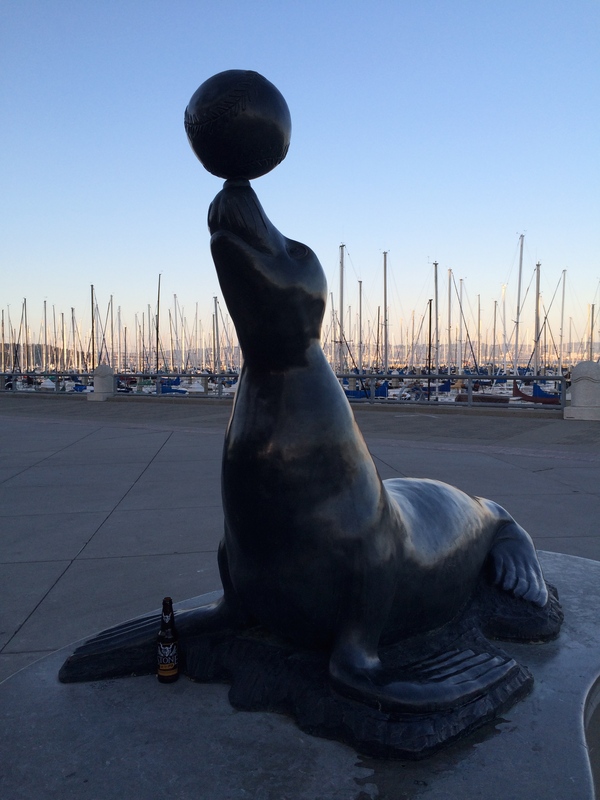 It’s a little hard to see in the twilight, but that’s a baseball on the seal’s nose. The statue is in the plaza at the rear of AT&T Park, where the San Francisco Giants play. I went there last week to see a pre-season game featuring my hometown team, the Oakland Athletics, who won handily. It was pre-season so it’s meaningless, except that the Giants are the reigning world champions, so it might say something about the A’s prospects for the regular season. Then on Monday I went to opening night at the Oakland Coliseum. People complain about the Coliseum for many reasons. For one thing, the Oakland Raiders also use it for football. But mostly they complain because it’s an old facility that lacks the glamour of AT&T Park, which is widely considered to be one of the premier facilities in the majors. Here are dueling photos from the seats at both parks. Here’s AT&T. If the photo was enlarged you could see the splash counter, which shows the number of times players have hit a home run out of the park and into San Francisco Bay, or what the locals call McCovey Cove. Here’s the Coliseum. It’s earlier in the evening, so it’s not an apples-to-apples since you can see the beautiful sunset. OK. Let’s just acknowledge that the Giants have a nicer house. 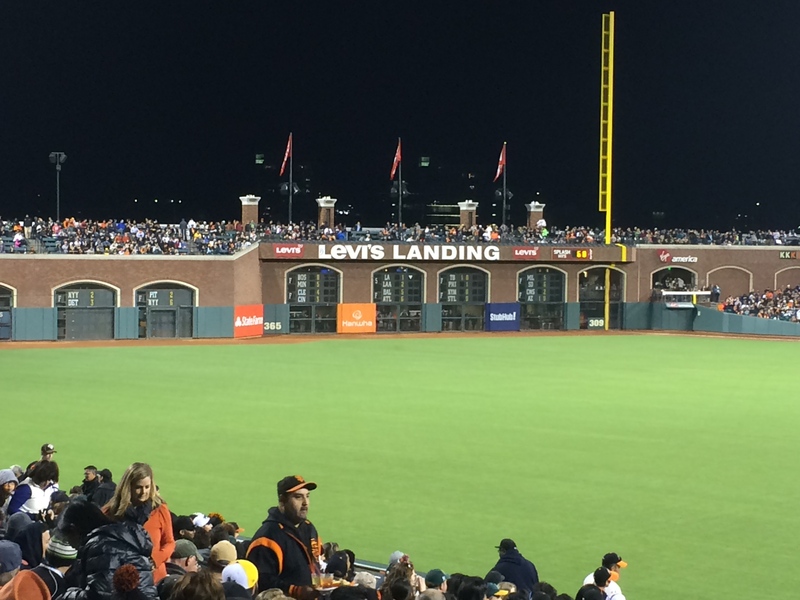 In defense of the Coliseum, it is a serviceable facility that has its charms. For example, true A’s fans know what is meant by the phrase “sun hit.” You see, during day games there is a fair probability that an outfielder on the opposing team will lose a lazy fly ball in the sun. During mid-season the sun goes down behind home plate, so the hapless opposing outfielder, who is not used to playing at the Coliseum, will have to battle the sun to try and catch a fly ball. I’ve seen a lot of sun hits. 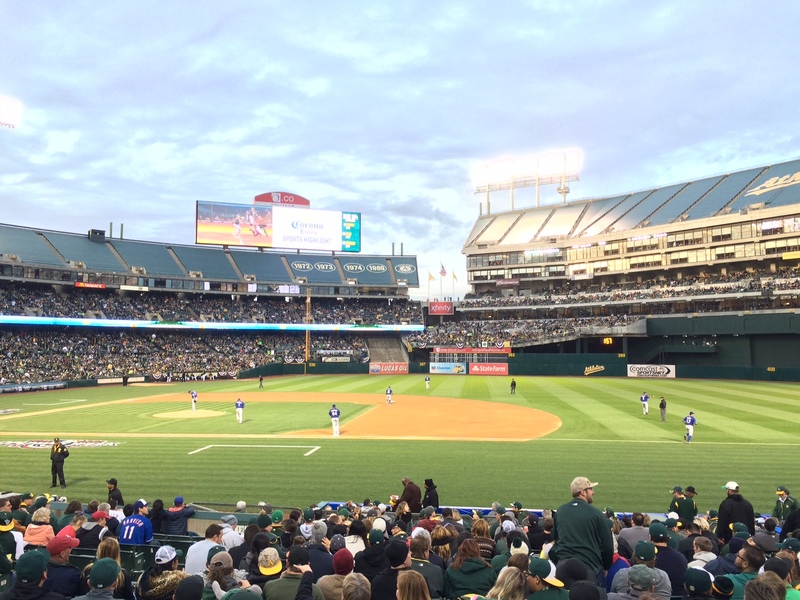 Another advantage of the Coliseum is that it is in Oakland, which means that the ambient temperature at game time will be much more comfortable than at AT&T. Here’s a tip: if you go to a night game at AT&T, dress warmly; wear layers. It doesn’t matter the time of year, or what the daytime temperature is. Once I went to a night game at AT&T in the middle of July when the daytime temperature was in the mid-80s. I arrived at the game dressed in shorts and a polo shirt. In the third inning I had to go the team store to buy something; anything, to keep warm. $100 later I was swaddled in Giants gear (oh the humiliation) and still freezing. But the best thing about the Coliseum is that it embodies the spirit of the team that plays there. 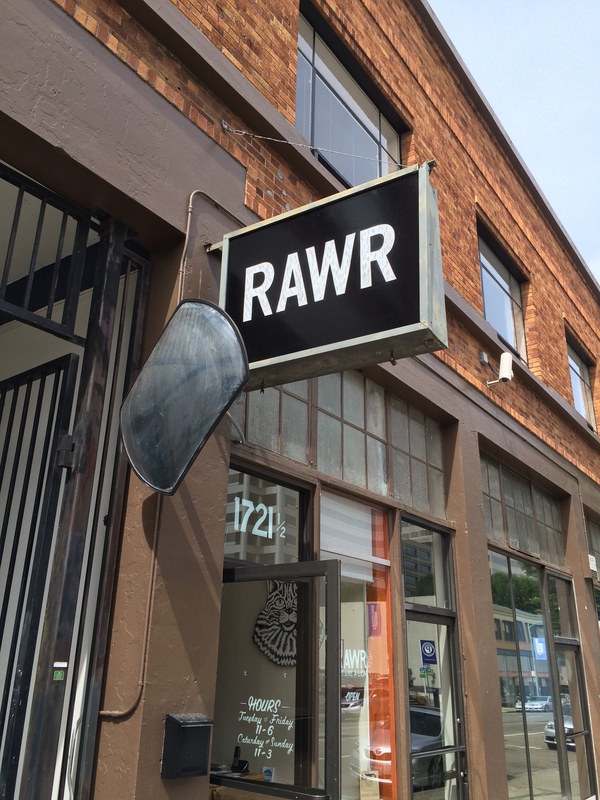 It resides next to railroad tracks in what used to be an industrial corridor. It is the blue-collar counterpoint to everything that goes on at AT&T, with its damnable wine and crab cake concessions and clam chowder sourdough bread bowls. At the Coliseum no self-respecting A’s fan would be caught dead eating a crab cake while sipping on a fine Chardonnay. No, we prefer the very large corn dogs that are called “Actual Size.” I’m not a Giants hater, even though they have an irritating tendency to win championships when their regular season play suggests they should collapse in the playoffs. Man, I love baseball. I love this time of year, when everything is fresh and new and you don’t have to worry about the playoffs because everyone has a shot. It started with a visit to the tax preparer. I was asked to present certain documents that I thought I had received and knew I had received, but that I’d misplaced, being the single parent that I am. So I went home and searched every nook and cranny. I never found said documents and concluded that I had to embark on an effort to clean up my home office. Nothing nefarious. It’s just that when you’re hit with the death of your spouse due to illness, there’s a natural tendency to avoid looking at old records because you’re reminded of your married life, which is traumatic; if you loved the person involved at the time of their death, which was the case with me. I kept stumbling upon stuff that triggered memories. I won’t go into that here. I’ve spent the last few weeks spending all my free time cleaning out my office and getting rid of dated material. All this paper needed to be shredded; or so I thought; to keep it private; to prevent identity theft; it’s so hard to recognize the line on something like that; it keeps evolving. 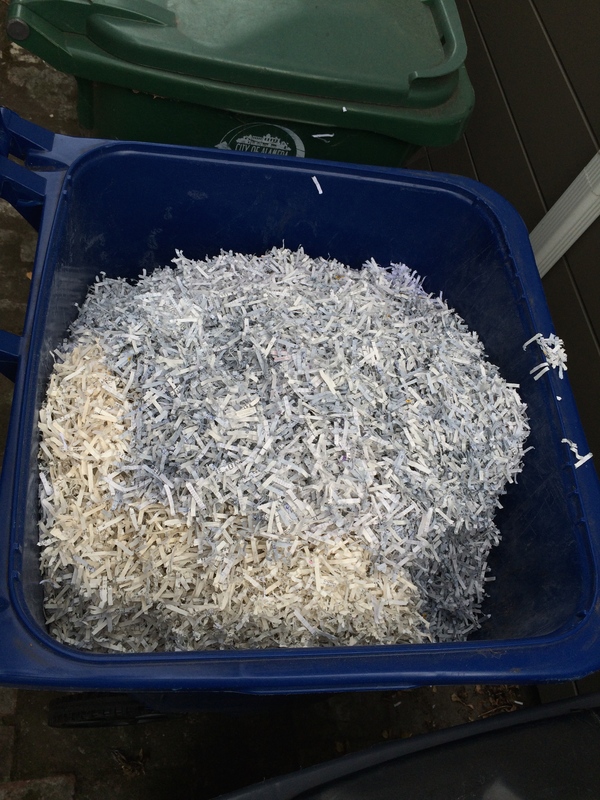 Anyway, I shredded a lot of stuff. I’ve spent most of my free time doing that the last few weeks, which is why I haven’t posted on this blog. I think this has larger applications to the population of people who are aged. We may, someday, be visited by some regulatory authority that says we’re out of compliance. I hope to be one of the evaluators rather than the subject under evaluation. Now I’m blogging about it and wondering if that’s the best way to go. Oh well. I did it to clear out my home office so I wouldn’t feel like a hoarder. You need to move on from things, and I felt I needed to seal the silver mine as regards the records related to my spouse; who is deceased through no fault of mine, and who I miss terribly every day. I love you Lisa, if you can hear me. I’ve kept the good stuff.